Independence Day at Ringwood Manor - July 4, 2016 ~ The History Girl! The historic and educational event celebrates its 17th year! The staff at Ringwood Manor is thrilled to once again announce the details for the annual Declaration of Independence celebration! Monday, July 4, 2016 marks the event's 17th year, having become an exciting and educational tradition for many families in the northern New Jersey area. 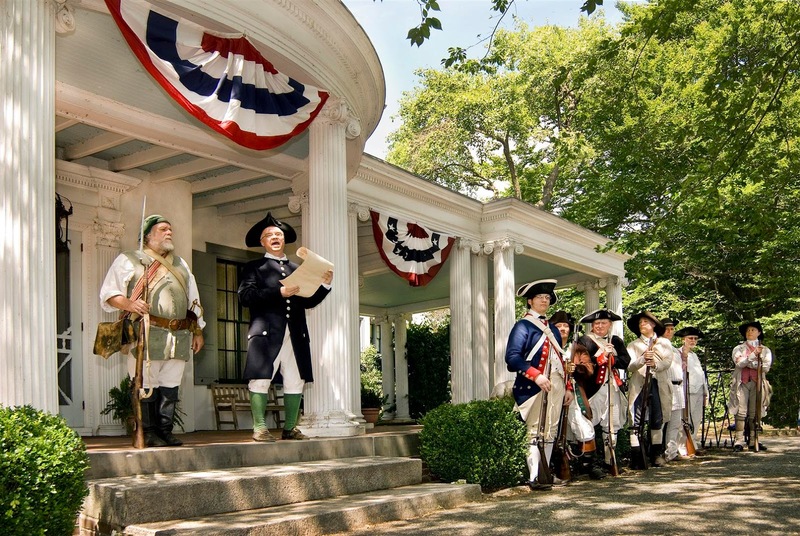 The highlight of the event is a dramatic delivery and reading of the Declaration of Independence on the steps of the Manors porch along with colonial crafters, activities, and demonstrations. The front lawn of the Manor is transformed into a colonial town square with Revolutionary War reenactors from New Jersey Militia- Heards Brigade, the 35th Royal Sussex Regiment, Outwaters Militia, the Friends of Long Pond Ironworks, and individual volunteers. All help to celebrate the 240th anniversary of American independence and bringing the historic experience to life. Following its creation, news of the Declaration spread to the colonists through public readings, which took place in large centralized spaces such as town squares, churches, and taverns. The Declaration was formally adopted on July 4th, 1776. The first public readings of the document took place four days after its creation in front of large crowds in Philadelphia, PA, Trenton, NJ, and Easton, PA. A day later, on July 9th, 1776, it was read aloud to Washingtons Continental troops in New York City. Readings of the document continued throughout the colonies during the months of July and August of 1776, with readings taking place from Watertown, MA and Portsmouth, NH to Halifax, NC and Savannah, GA. The celebration at Ringwood Manor attempts to recreate the same excitement felt by colonists when they first heard those famous words 240 years ago. The festivities will begin in front of Ringwood Manor at 1:00 pm, when colonial era toys and games will be available for visitors to play with. Visitors young and old can try to sign their John Hancock on a copy of the Declaration using a traditional quill pen and ink. Colonial crafters, demonstrations, and displays will turn the front lawn of Ringwood Manor into an 18th century town square. An exhibit on Ringwoods own Surveyor General Robert Erskine and his role in the American Revolution will also be on display. The ceremony itself will begin at 2:00 pm with a short introduction about the history of the event, noting that the afternoon recreates events that happened in the area spanning a three-year period, from 1775 to 1777. A lively debate among members of the crowd will break out, involving British soldiers, area Loyalists, and the supporters of the cause for independence, the colonial rebels. After the debate concludes, the local militia unit will form and muster up as it did original in 1775. Soon after, the Declaration will be delivered to the front steps of Ringwood Manor by a horse and rider. The document will then be read to the crowd by local reenactor, Larry Stephan, at 2:30 p.m. Visitors are encouraged to listen closely and cheer and jeer during the reading. Following the reading, the British Grand Union flag will be replaced with the first version of the new countrys flag, known as the Hopkinson flag. It was designed in 1777 by Francis Hopkinson, one of the signers of the Declaration of Independence representing New Jersey. After the flag is raised, the militia will perform a ceremonial musket volley. The bell atop Ringwood Manor will then be rung thirteen times, concluding the ceremony. But the fun does not stop there! The public is encouraged to stay after the ceremony as the celebration continues, with children able to join the Continental Army and learn military drills with the reenactors. The North River Historical Dancers will perform 18th century dances in the back gardens with members of the public who wish to join in! Along with the activities, the Sugar Loafe Baking Company will be back again, selling delicious 18th century baked goods to the crowd. Colonial items and keepsakes will also be available for purchase from sutler Lady Ellen. Free watermelon slices are available to everyone who attends. All are welcome to join the fun! While there is no charge for the Independence Day celebration, there is, however, a parking fee of $5 per car for in-state residents and $7 per car for out-of-state residents to enter Ringwood State Park. Ringwood Manor's interior will be open to the public in a self-guided format between 10:00 am and 1:30 pm with the ceremony and celebration to proceed shortly thereafter. The fee to enter Ringwood Manor is $3 for adults, $1 for children ages 6-12, with children 5 and under free. The event will take place rain or shine. Ringwood Manor is located at 1304 Sloatsburg Road, Ringwood, NJ, within Ringwood State Park. 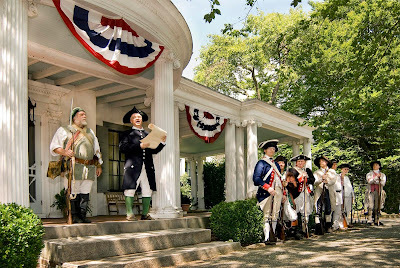 Independence Day at Ringwood Manor is sponsored by the North Jersey Highlands Historical Society and the Ringwood State Park staff. For information, call 973-962-7031 ext. 0 or visit www.RingwoodManor.org.